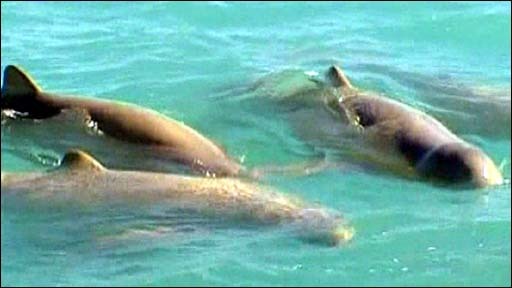 A camera crew has filmed a rare species of dolphin that has only been known to scientists for three years near Broome, Western Australia. The recent discovery of the Australian snubfin dolphin has led scientists to search the Australian coastline for the elusive animals. According to the research team, the sighting is the best yet as the dolphins were playful and poked their heads above water. Scientists were also able to record underwater sounds the dolphins made while communicating.